The contest clearly showed interest in real achievements and results of creative solutions in cultural tourism and highlighted that Cultural Tourism must be sustainable and promoted more due our present difficulties, particular in fighting unemployment and to turn resources and solutions into realities. It was very rewarding that this contest has been so successful upon its first time. 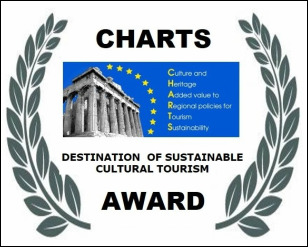 CHARTS Award recorded a number of 27 applications from various destinations in 11 countries across Europe participating to promote their achievements, results and outputs on cultural tourism with focus on local and regional context. The Award Commission has decided that with the Award “Destination of Sustainable Cultural Tourism 2014“ with the 1st prize is to be awarded to cultural route ‘Way of Saint James’ in Catalonia, Spain, with the 2nd prize is to be awarded to Limbazi city in Vidzeme region, Latvia and with the 3rd prize is to be awarded to Cittadella city in Veneto region, Italy for their achievements, results and outputs in cultural tourism. The Winners of the CHARTS Award were announced at the prize ceremony on 12 September 2014 during CHARTS Closing Conference. The contest was launched in London, November 2013 during World Travel Market and remained open for 7 months and promoted at the tourism fairs across Europe - BaltTour 2014 in Riga, BIT 2014 in Milano, ITB 2014 in Berlin, Romanian Tourism Fair in Bucharest and other external events by project partners. The CHARTS Award was based on a contest in 12 categories between tourism destinations Europe-wide for results of actions which have been implemented and which have produced significant results and achievements. The CHARTS Award was based on a contest amongst destinations Europe-wide for achievements, results and outputs in cultural tourism. The focus of the contest was on 12 Good Practices themes of CHARTS, concerning results of actions which have been implemented and which have produced significant results and achievements in tourism destinations across Europe. 5. Contribution to Europe 2020 targets. The number of bids received – 27 Applications from 11 countries: Bulgaria (3), Cyprus (1), Germany (1), France (1), Greece (1), Italy (3), Latvia (4), Romania(6), Spain (5), Sweden (1), UK (1). This competition is not seen as a one-off Award – European Cultural Tourism Network will take it over in the future in order to continue competition between destinations for Cultural Tourism promotion, as project legacy.